Syracuse, NY. The Julius Hunziger House on Robineau Road. Ward Wellington Ward, architect, 1926. Photo: Samuel D. Gruber 2017. Syracuse, NY. The Julius Hunziger House on Robineau Road. Ward Wellington Ward, architect, 1926. Replacement fireplace. Photo: Samuel D. Gruber 2017. Syracuse, NY. The Julius Hunziger House on Robineau Road. Ward Wellington Ward, architect, 1926. 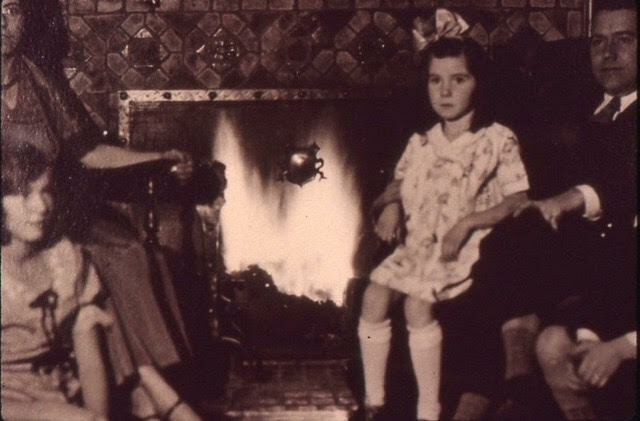 Original living room fireplace revealed. Photo: Samuel D. Gruber 2017. Earlier this month I joined some members of the Arts & Crafts Society of Central New York and Strathmore neighbors at the "new" home of Michael Matthews and Jane Crow. The house was really built in 1926 for the real estate salesman Julius Hunziger and his family, who lived there until 1932. Designed by noted local Arts & Crafts architect Ward Wellington Ward, it was the last of his several houses built in the neighborhood from the time the Strathmore subdivision opened in 1919. It was also one of Ward's very last projects overall, as he died in 1926, the year the house was completed. Michael and Jane recently purchased the house and are now fixing it up before moving in. Most of the original features are intact. The overall style and detailing mixes elements of the then-popular Colonial Revival style, as can be seen in the stairway and in many of the moldings, but with Ward's English-inspired Arts and Crafts approach to design in the arrangement of the rooms, the window, and the built-in cabinets - all of which were design components he had perfected before World War I. The new owners were perplexed, however, by the fireplace. The shiny slabs of black marble surrounding the fireplace were clearly later additions, and it was known that the mantle, too, was a replacement, though apparently modeled on the original. In discussions with Arts and Crafts Society members over lunch at the Annual meeting which Jane and Michael attended, it was unanimously agreed that the original fireplace would have had Moravian tile decoration, as did all Ward's fireplaces. We wondered if the original was intact beneath the black marble. 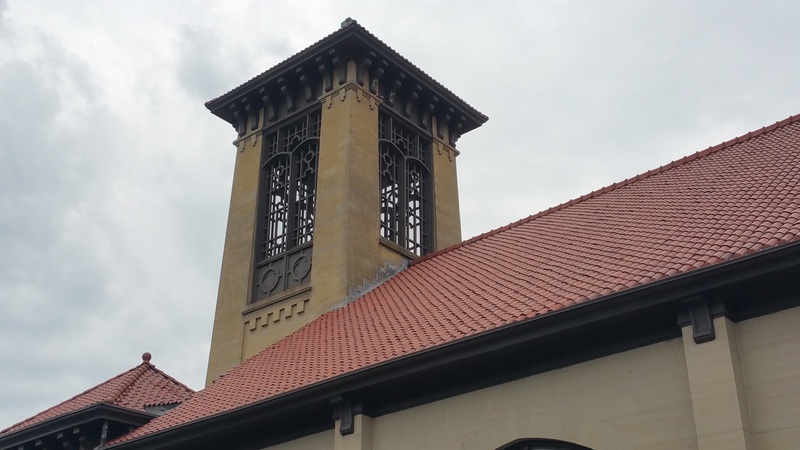 According to Cleota Reed, expert on both Ward and Henry Mercer and the Moravian Pottery and Tiles Works of Doylestown, PA, thousands of fireplaces across the country were made using Mercer (or Moravian) tiles. No architect. however, built more fireplaces with more than Ward Wellington Ward. There were hundreds of tile types and thousands of combinations. Michael was curious, and so moved the wooden mantelpiece, and poked around the fireplace, and with little effort was able to pry off one of the marble slabs. Behold! The original fireplace decoration was there and still in good condition. So Michael and Jane invited people over to witness the unveiling, and with eyes wide we watched as two more panels fell away to reveal a complete series of twelve tile zodiac designs spaced on the sides and above the fireplace. In the center was a tile of a sailing ship, a popular emblem of the Arts and Crafts Movement and a favorite of Ward Wellington Ward. These Zodiac tiles are simple designs and follow an age-old tradition. Representing the Zodiac goes back to the Babylonian's but it was especially a popular motif in the Middle Ages (often connected with images of the labors of the months) denoting the passage of the year in relation to the celestial calendar. For Ward and the Hunzigers, however, there was probably no deep meaning in the selection, and the tiles were simply used as familiar decorative series. Still, one can imagine the little Hunziger children attracted to the colorful zodiac motifs of animals and figures and the sailing ship, too. There were probably plain or a pattern of colored tiles on the floor in front of the fireplace, too, but these must have been dug out and removed to lay the black slab there now, flush with the floor. The rest of the house looks great, too. For Ward Wellington Ward enthusiasts the most notable details are the front windows set opposite the fireplace. These are clear windows but set in lead tracery with decorative and heraldic devices. Thank you Jane and Michael for sharing your discovery and your new home with the community! May you enjoy it for many years to come. To learn more about Henry Mercer and the Moravian Pottery and Tile Works the must read book is Cleota Reed, Henry Chapman Mercer and the Moravian Pottery and Tile Works (Philadelphia: Univ. of Pennsylvania Press, 1987). For more on Ward Wellington Ward search this blog. Syracuse, NY. James Street United Methodist Church. W. R. Brown, arch. 1916. Photo: Samuel D. Gruber 2014. Syracuse, NY. James Street United Methodist Church, windows after 1919. Photo: Samuel D. Gruber 2014. Syracuse, NY. James Street United Methodist Church. Redesigned interior. Photo: Samuel D. Gruber 2014. I was recently elected president of the Arts & Crafts Society of Central New York, so in the past few weeks I've cast my eyes about the region thinking of the effect of the Movement in the shaping of art and architecture in Central New York in the late 19th and early 20th centuries. I've mostly thought of the people and places where the most complete and intentional expression of the aesthetics and philosophy of the movement are apparent, such as in the furniture and Craftsman Houses of Gustav Stickley and his associates, for or in the architecture of Ward Wellington Ward or in the exceptional houses by Catherine Budd and William Henry Peters, built on Robineau Road alongside those by Ward. But there are many less well-known and documented instances in Central New York design where Art & Crafts elements break through, mostly either simplifying some of the (often brilliant) excesses of the architecture of the Gilded Age, or after 1900 as an alternate to rules and regularity of Renaissance and Roman revival design. These include a small number of public buildings, including some churches and schools. 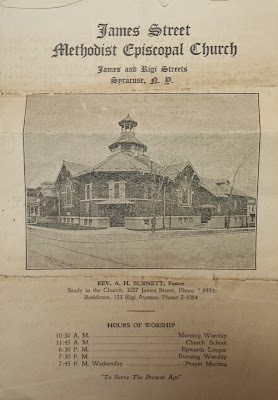 A few years ago my colleague Bruce Harvey and I were engaged by the City of Syracuse to carry out an religious property survey in the city to access the historical and design qualities of more than 100 present and former churches, synagogues, and religious school buildings. This survey showed that while there are still extant a large number of 19th-century churches built in historicist styles and a large number of well and often creatively-designed modern churches of the post-World War II period, there were few religious structures that showed appreciation by the architect or the commissioning congregation of Arts & Crafts design. We can only speculate on the reasons for the small number of Arts and Crafts churches. Part of it was timing, the style seemed most popular in the years preceding World War I, and then afterwards tastes changed. In Syracuse two churches include Arts and Crafts elements are from this period.. These former First English Lutheran Church at 501 James Street from 1910-11, which I have already written about, and the James Street Methodist Church of 1916, described below, located in Eastwood. 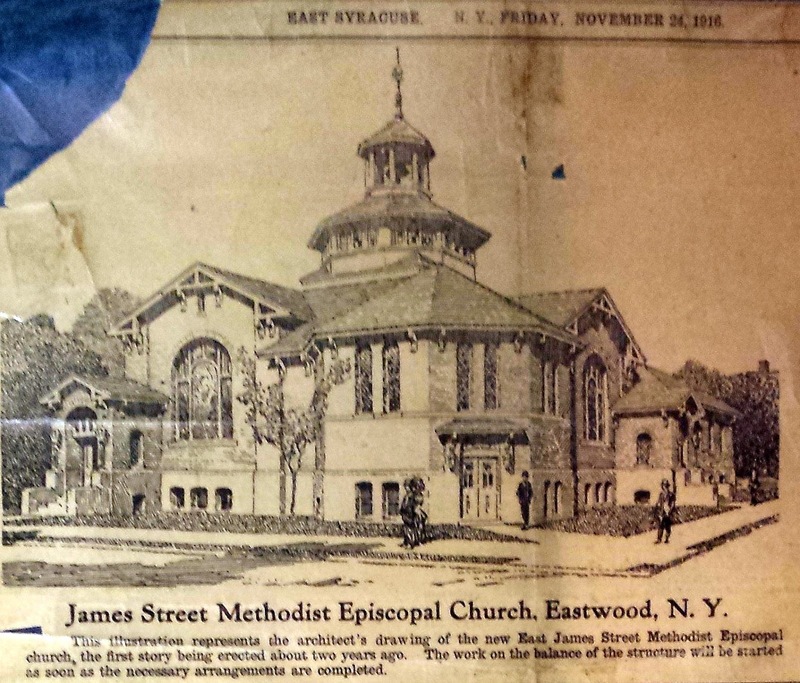 In 2016, a century after the church design was first published, the James Street Methodist church was sold. The Austin organ of was sold beforehand and removed. I have not been in the church since the sale to see what changes have been made. Syracuse, NY. James Street United Methodist Church, exterior detail. W. R. Brown, arch. 1916. Photo: Samuel D. Gruber 2014. Also, much of the Arts & Crafts aesthetic is about individual or family living, and this is best applied in more intimate settings. That is why, in part, there are so many Craftsman houses but one doesn't see many (or any?) Craftsman churches. Already in the late 19th-century, however, there was a tradition of open wood roof construction in many churches, and this presages in some ways the reverence for traditional craftsmanship of the Arts & Crafts Movement. In England there is a direct line between Pugin and the Gothic Revival and William Morris and the Arts and Crafts Movement. In American church architecture, the Gothic Revival remained strong, and a particular brand of English country Gothic was popular through the 1920s among the same social class and mainstream Protestant groups who mostly supported Arts and Crafts design at home. This English Gothic could also be built on an intimate scale. We have examples in the city such as Saint Stephen's Lutheran Church on the Northside (1929), Saint Alban's Episcopal Church on the Eastside (1929 ff), and many more. These churches could include some Arts & Crafts detail work, especially in wood, metal work, and stained glass. In England, Arts and Crafts masters such as Henry Wilson had a close relationship with the Anglican Church and provided many important church furnishings. Syracuse University architecture professor Frederick Roy Lear excelled in Gothic design and his work is apparent in the former English Lutheran Church of Atonement (1927) and the former Lafayette Avenue Methodist Church (1928). Syracuse, NY. James Street United Methodist Church. Drawing of church in 1916 before construction. Syracuse, NY. James Street United Methodist Church. Program from 1920s. Begun in 1919, the James Street United Methodist Church occupies a site on the north side of James Street in the former Village of Eastwood, at Rigi Avenue. The design reflects a Renaissance style filtered through an Arts & Crafts aesthetic. The building is on a lot donated by a parishioner J. C Surbeck, a “pioneer of Eastwood.” The church was built with a central raised bell tower and open lantern surmounting the center of the sanctuary roof. This raised element is now gone, already removed by the 1960s. The architect was W. R. Brown of Brown, Blauvelt Co, from Rochelle Park, N.J. The church has an unusual plan that contributes to a complex roof structure. The focus of the sanctuary is a raised area for the communion table set in an apse-like projection from the south east corner of the building. Seating in the sanctuary, which was originally in curved benches, faces southeast. A low barrel vaults covers most of the sanctuary space. The building originally had three street entrances. One was a fairly low double door entrance on the chamfered building corner that was surmounted by a projecting shed roof supported by decorative brackets, above which were two round-headed lancet windows filled with stained glass. This entrance probably led to the ample basement (where services were held when the building was first under construction) and also into the sanctuary via doorways to the sides of the raised communion area. Until 2016, an organ occupied this space. The doorway and windows were filled in 1948 when the building underwent structural renovations, and also an interior remodeling. Today, the foundation level stonework runs continuously across this part of the building. Other entrances to the church are up steps on James Street and Rigi Avenue.On James Street, steps lead to projecting gable-roof porch to the left of the south sanctuary arm and a large arched stained window, filled with stained glass. On Rigi Ave. there is side entrance, projecting out to the sidewalk from the body of the church, up steps to a door in a small lean-to-roofed wing. The entrance doors on both sides maintain their original decorative hardware. A functional addition to the church was added to the north end in the post-World War II era. Though designed by noted modernist Gordon Schopfer, it does not display unusual or exceptionally technically innovation and architectural expressive elements, as do many other Schopfer commissions. The original stained glass is in all the windows. Geometric patterns are used for windows to non-liturgical spaces. The three large arched windows the light the sanctuary are more ornate. The two memorial windows facing James and Rigi Ave. include large figurative religious scenes. The window facing Rigi Ave. represents Jesus as a shepherd of his flock. The window facing on to James Street represents the Three Marys at the Tomb with the Angel announcing Christs resurrection. It is not known what studio designed and manufactured the windows. The origins of the church are in a Revival held in January 1912 in 67 persons professed conversion, leading to the desire for a church in Eastwood. A large basement was designed and built allowing a space forth the new congregation led by Rev. Richard Lowry. The congregation first met in a barber shop, then in the basement of the church as it was under construction. Rev. Lowry’s sudden death, however, in 1913 led to the arrival of Rev. Dr. William H. Powers, who oversaw the erection of the church. Powers subsequently became Dean of Hendricks Chapel at Syracuse University. The church was dedicated on June 20, 1920 by Bishop Burt, head of the Methodist conference, assisted by Rev. William H. Powers, then pastor. It was established as a “unity church” but the Methodist ritual was followed throughout all services. Among the denominations worshiping “in perfect harmony” were besides the Methodist Episcopal, “Episcopalians, Baptists, Lutherans, Presbyterians, Congregationalists, Roman Catholics, Weslyan and Free Methodists, Evangelicals, Christian Scientists and New Thoughters.” In 1923 there were reported to be 500 members of the church from “all parts of Eastwood and the outskirts of Syracuse.”In 1937 The Syracuse Journal reported membership over 400 and a constituency of about 1,000.